In case you missed it I swatched Manglaze Matte Nail Polish in Mayonnaise Here. Since I took off my acrylics a year or so ago I haven't really been that much in to nail polish mainly because I don't paint my own nails very well. For this polish tho I will take the time to paint my nails because it's so awesome! This is a seriously epic nail polish it's pink but in certain light you can definitely see that is has blue undertones with a bit of purple sheen! I think the swatches really speak for themselves with this one. Even if your not a pink person this deserves a spot in all of your collections. 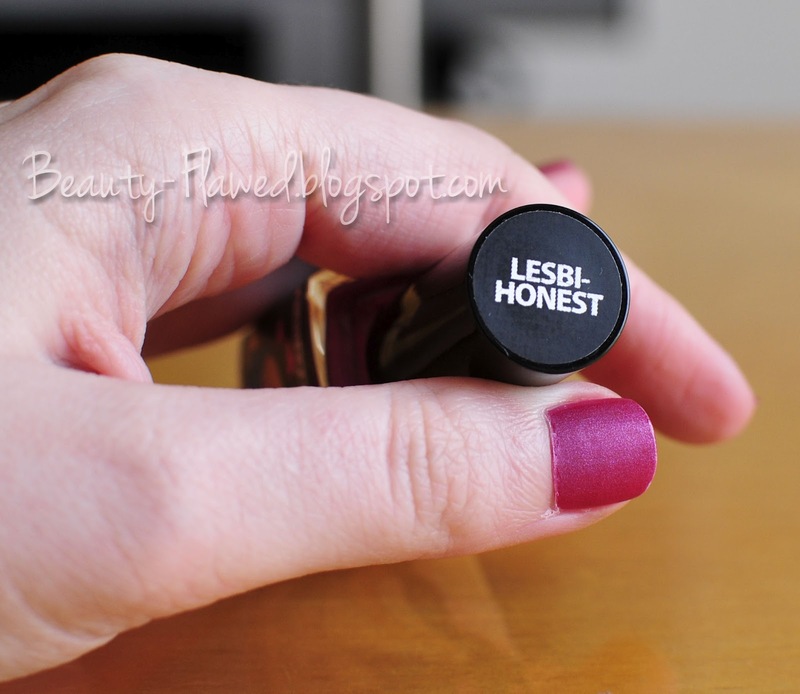 It dries really quick and can easily cover in one coat because it is highly pigmented. I had 0 issues with coverage or streaks. In the photo's I did two coats for extra matte-ness as long as your not doing super thick coats you can do two with no problem. You can find Manglaze on Facebook, Facebook Store, or Amazon. This product retails for $13.13! Lets be honest what do you think of Lesbihonest? Ingredients: BUTYL ACETATE, ETHYL ACETATE, NITROCELLULOSE, ACETYL TRIBUTYL CITRATE, ADIPIC ACID/NEOPENTYL GLYCOL/TRIMELLITIC ANHYDRIDE COPOLYMER, ISOPROPYL ALCOHOL, SILICA, MICA, STEARALKONIUM BENTONITE, ACRYLATES COPOLYMER, TITANIUM DIOXIDE, STYRENE/ACRYLATES COPOLYMER, RED 34 LAKE, BENZOPHENONE-1,TRIMETHYLPENTANEDIYL DIBENZOATE 11 ML 0.37 FL. OZ. ©ManGlaze® INK. Chicago, IL 60626 Caution: avoid heat or flame. Made in U.S.A. Very Pretty!! I really love the color. This line is just awesome! I think their names are even more catchy than OPI which I thought ruled the naming game of nail polish colours. Yes I definitely think their names are more on the adult side instead of being cutesy which I like most. It's a really pretty shade! That's where I saw mine too from Trace Face she always does such good swatches she posted this back in like January and I finally got my hands on one! haha love the name! This color is so pretty! hey girlie! found you on blog hop! The name of the polish cracked me up and it's such a pretty pink! I think matte nail polishes are coming back this season, I'm seeing them everywhere. This polish is so pretty. Out of all the nail polishes I own I only have one matte nail polish, maybe it's time to get more lol. Yeah I really like them I'm starting to like them a lot more than just shiny finish polish! OMG I need this!! hahaha soo pretty and I love the name and bottle!